Biofinity Energys monthly contact lenses Designed for Digital Life! Our eyes suffer daily from the use of screens and digital devices. It is an important and necessary part of our lives but many hours in front of the computer or similar can take its toll. We spend the day changing focus distances, we look at the computer, we move on to something else, then we refocus on the mobile phone ... This can lead to a problem of digital visual fatigue. Visual fatigue is a sensation of discomfort and eye fatigue that is experienced after two or more hours looking at a screen. The associated symptoms are tiredness, dry eye, tension and heaviness of eyes and eyelids. 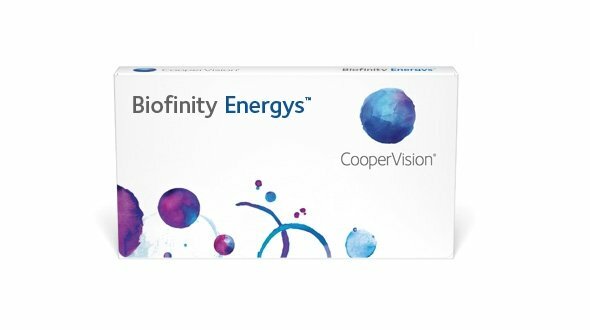 CooperVision launches Biofinity Energys contact lens, created and designed for digital life. Its optical design together with a state-of-the-art material make it the ideal lens to reduce fatigue and eye dryness caused by visual fatigue. Digital Zone Optics: It is a special lens design based on the cutting of aspheric curves that create a more positive power in the center of the lens, reducing the accommodative effort, therefore we will have a lower level of fatigue. Aquaform Technology: High manufacturing technology that makes the lens retain water in its interior, staying hydrated for many more hours. This natural moisture, without additives, helps to have less dry eye feeling, even at times when it blinks less, for example in front of the computer screen. Currently, most users of online contact lenses choose a monthly replacement, and this is due to its many advantages over other types of conventional, semi-annual, biweekly or even daily lenses. They are slightly cheaper than daily, its use is for a full month. Being a monthly lens, it does not allow time for accumulated deposits on the surface to denature and generate problems of intolerance or rejection. Visual revisions tend to be more frequent with these lenses, therefore, if there is a change of graduation, it is updated for the next purchase, so that we will always look good. If we have a problem with a lens, it is lost or broken, we can easily replace it with another one. When ordering your Biofinity Energys contact lenses in Prodevisión, it is necessary that the contact lenses have been prescribed by an Optical Vision specialist or Ophthalmologist, from there, you must place your order by copying the parameters of the last Biofinity contact lens case. you have acquired, that is, the first adaptation has to be done by the professional who will assess vision, movement of the lens in the eye and also teach you the correct operation and maintenance of the lens. It is important to mention the maintenance fluid, usually called a single solution. This must be of quality (first mark, all liquids are not equal) and it is always possible to use it. A change of liquid can cause serious problems when using contact lenses. In Prodevisión we have the first and best brands of online maintenance liquids on the market that assure you that they will take care of your eye and your Biofinity Energys contact lenses with all the guarantees. It is essential to follow all indications for use of the manufacturer (CooperVision) of Biofinity monthly contact lenses in terms of hours of use, care, handling and replacement. Regarding the replacement, it is very important to respect it, given that, they are discarded one month after opening the blister that comes from the factory (there are not 30 sets, but 30 days after opening). The lenses with the passage of days accumulate tear deposits, dust, environmental dirt, poor cleaning ... If the lenses are not discarded they can trigger an eye irritation and consequently an allergic reaction. If you notice discomfort when wearing them, red eyes or do not see correctly, remove your contact lenses immediately and discard them, consult your optician or trusted ophthalmologist. Otherwise, you may have eye problems.